Cook up an egg with this deluxe wooden pan set by Viga. 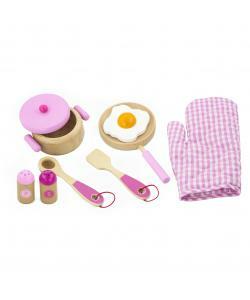 The set includes a saucepan with lid, frying pan with egg, spatula, scoop, salt & pepper shakers and an oven glove. 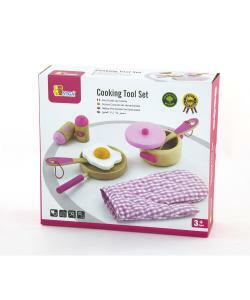 Matches perfectly with the Viga pink kitchen or is great as a stand alone kitchen toy. Made from high quality wood, hand painted for a superior finish. Perfect for pretend play, includes pretend fried egg.